Denali Princess Wilderness Lodge is the perfect base camp for exploring Denali National Park. The name ''Denali'' means ''The Great One'' in the native Athabascan language. At 20,310 feet above sea level. 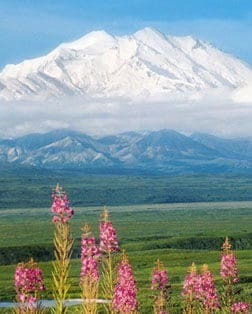 Denali is the highest peak in North America and is surrounded by one of the world's most spectacular wildlife sanctuaries. Denali National Park is home to many types of wildlife including caribou, moose, wolves, Dall sheep, bald eagles, and the mighty grizzly bears. Leave it to Princess to offer excursions for all types of adventurers. Enjoy a scenic float down the Nenana River or an exhilarating jetboat safari. Play a round of golf in the Midnight Sun, or rise above it on a thrilling flightseeing tour. Hike in the backcountry, hoot and holler at the Music of Denali Dinner Theatre, or visit an Iditarod champion's dog kennel ... and hold the puppies! It's all up to you. Let us introduce you to Denali National Park - up close! The highest mountain in North America, Denali is also perhaps the coldest mountain in the world outside of Antarctica, a challenge even to the most experienced climbers. Denali National Park and Preserve is home to six million acres, and preserves not only Denali, but also the pristine alpine terrain and abundant wildlife in the surrounding lands. Glaciers cover one million acres, or one-sixth of Denali National Park. The most massive glaciers in the park drain snow and ice from the flanks of Denali. Starting from its glacial headwaters high in the Alaska Range, the Nenana cuts north through the mountains alongside Denali National Park, offering several major rapids and thrilling whitewater rafting. The Stampede Trail was a mining trail blazed in the 1930s. Today, what is now known as Stampede Road begins near the Nenana River and is popular with travelers on foot, bicycle and snow machine. Our tours provides an in-depth look at the world of dog mushing and the Iditarod, Alaska's great sled dog race, including the training, racing and breeding of these champion sled dogs. Alaska's arctic tundra is found in Alaska's interior toward its northern or western coast. It's treeless and often bitter cold, and dotted with small lakes, or divided into strange geometric patterns. Black Diamond Peak promises dramatic views of the entire Healy Valley and a chance to witness foxes, rabbits and the occasional wolf, bear or caribou.